Pinot Noir lovers will always harbor fond memories of the legendary Williams Selyem Winery started in 1981 by Burt Williams, Ed Selyem and their families. The winery’s success was unprecedented given that Burt and Ed went from making wines in a garage to producing world-class Pinot Noir without any formal training or experience in winemaking. Burt was a printing press operator for the San Francisco News Agency and a home grape winemaker, while Ed was a wine buyer and accountant for Speer’s Market in Forestville as well as a home beer and fruit winemaker. They began making wine together from Sonoma grapes for their own use in Burt’s garage in 1979. Burt’s desire was to make world-class wine, mainly for his own consumption, and Ed’s dream was to create a thriving business from the local agricultural bounty. Together, they started with no capital, never borrowed, and grew their business while they continued to raise their families and work at their day jobs. The pair launched their commercial winery, Hacienda del Rio, in 1981 and their first Russian River Valley Pinot Noir release in 1982 was instantly popular with Burgundy lovers. A complaint from Hacienda Winery led the partners to drop the original name and use their own names. The classic Williams Selyem label first appeared in 1984, designed by a graphic artist, displaying a simple red and black color scheme and adorned with a single dingbat. Burt and Ed were true “garagistes,” crafting their wines from 1983 to 1989 in a rented 2-car garage on River Road in Fulton. In December 1989, they moved to an unpretentious building on Westside Road on the Allen Ranch where Howard Allen, the owner of Allen Vineyard, had built them a winery. There were two secrets to the success of Williams Selyem. First, they had a knack for sourcing grapes from marquee vineyards in the Russian River Valley, Sonoma Coast and Anderson Valley. Second, their oldfashioned production techniques, which were born out of a lack of capital for investing in equipment, actually benefited their resultant Pinot Noir wines. Their winemaking approach is now widely used in California and Oregon in the production of premium Pinot Noir. The winery quickly achieved cult status and Ed found it challenging to allocate the wines. He created a mailing list, the first of its kind for domestic wineries, and the winery sold 85% of their wine directly to consumers on the list. I was lucky to join the list in 1989 and communicated often with the highly personable Ed Selyem while ordering wines. The list rapidly filled up and those on the list rarely dropped out necessitating a waiting list that reportedly reached 10,000 names. Lucky newcomers waited at least two years for a small allocation. The winery never had the need for a tasting room. Unfortunately, although Burt and Ed shunned publicity and desired to remain small with a production of about 8,000 cases annually, they found the management of the business overwhelming. Burt was quoted as saying “I wanted to buy grapes and turn them into good wine. We weren’t trying to conquer the world or make millions of dollars. We never imagined that we would become a cult winery capable of selling everything we made.” The winery was sold in 1998 for a reported $9.5 million to New York vintner John Dyson, much to the chagrin of the Williams Selyem loyal following. The selling price reflects the popularity of the brand since the sale only involved the Williams Selyem name. The winery did not own a winery or any vineyards. The last vintage for the original Williams Selyem team was 1997. Bob Cabral replaced Burt Williams as the winemaker at Williams Selyem and remained at the winery until 2015 when he became the Director of Winemaking for Three Sticks Wines in Sonoma. After the sale of Williams Selyem, Burt Williams established a vineyard in the deep end of the Anderson Valley, Morning Dew Ranch. In 2008, after his non-compete clause had elapsed, he produced a Pinot Noir (197 cases) from his own vineyard. He followed that release with another Morning Dew Ranch Pinot Noir in 2009, which was, in his words, “a wine apart.” That was to be the last commercial Pinot Noir crafted by Burt. His Morning Dew Ranch grapes were sold to other wineries including Brogan Cellars, Woodenhead, Williams Selyem, Whitcraft Winery and Drew Family Cellars until the winery was sold in 2015 to Castello di Amorosa of Napa Valley. Ed Selyem, who has never received enough credit for his winemaking contributions, shunned the limelight and the press following the sale of Williams Selyem and has cherished his privacy in retirement. Many former workers at Williams Selyem benefitted from the generosity of Burt and Ed who were always open to sharing their skills, and several became successful winemakers on their own. Nikolai Stez was an assistant winemaker at Williams Selyem for 17 years. Along with his domestic partner, Zina Bower, they founded Woodenhead Vintners which continues to this day. Visit www.woodenheadwine.com. Ross Cobb, the owner along with his family of Cobb Wines, worked at Williams Selyem in the 1990s. Today, Cobb Pinot Noir from Coastlands Vineyard and other vineyards in the Occidental area of western Sonoma County are in great demand. Visit www.cobbwines.com. Mac McDonald picked up much of his winemaking acumen from Burt Williams. One of the few African-American winemakers, he currently crafts Pinot Noir under the Vision Cellars label in Windsor. Visit www.visioncellars.com. Ben Papapietro and Bruce Perry were pressmen who worked alongside Burt Williams at the San Francisco Newspaper Agency. By 1980, Ben was producing garage wines and Bruce joined him a few years later. Both of them worked harvest with the crew at Williams Selyem. After years of praise for their homemade wines from friends and family they launched Papapietro Perry with 75 cases of Pinot Noir in 1995. Visit their tasting room in Healdsburg or www.papapietro-perry.com. George Levkoff left his bond trading job after a Williams Selyem wine epiphany and worked a harvest in 1999 at Williams Selyem. Over the next few years, he continued at Williams Selyem and helped out at Brogan Cellars. He started his own label, george wine company, in 2003. The wines are sold exclusively to a mailing list and elite restaurants throughout the U.S. Visit www.georgewine.com. Family members ventured out on their own and began to produce Pinot Noir in the Williams Selyem style and spirit. Burt’s daughter, Margi Williams-Wierenga started her own label, Brogan Cellars, with the release of a 1998 Russian River Valley Pinot Noir. Her 2001 Russian River Valley Pinot Noir won the Red Wine Sweepstakes Award at the Sonoma County Harvest Fair. Margi’s production of Pinot Noir, Chardonnay, Zinfandel and Sauvignon Blanc remained at about 1500 cases annually until her retirement in 2018. 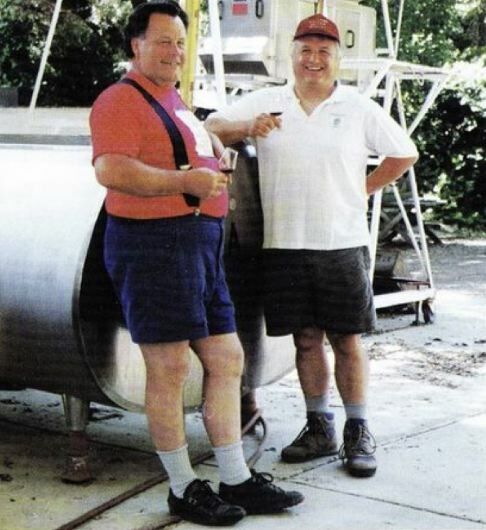 Burt’s son, Fred, followed in his father’s winemaking footsteps. Along with co-owner Alyssa Barlow, their Seven Lions brand was launched with the 1999 release of wines from Russian River Valley fruit. The initial wines were well-received by the press, but tragically Fred passed away in 2003. Margi Williams-Wierenga helped finish the 2002 and 2003 Seven Lions wines that were labeled “Fred’s Hands” in his memory. WesMar (pronounced “Wesmare”) is a partnership between domestic partners Kirk Wesley Hubbard and Denise Mary Selyem. Kirk and Denise were managers at a Northern California Costco warehouse in 1995 when they left the business world to join Ed Selyem and work under his tutelage for a few years. When the Williams Selyem winery was sold, they began planning their own wine venture. They left Williams Selyem in 2000, launching the WesMar label and moving into an old apple processing warehouse in Sebastopol where they have remained to this day. Within 1500 square feet of space, much like the original garage where Burt and Ed made wine, they set up an artisan, garagiste winery where all phases of wine production are carried out. There is no fancy sign or modern winery accruements. Besides marriage partners, they are equal partners in all phases of winemaking. 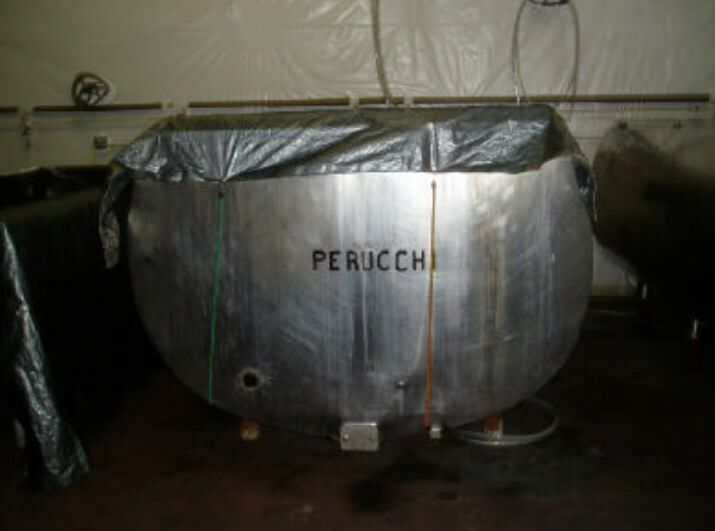 They strictly adhere to all phases of winemaking that they learned at Williams Selyem, including conducting fermentations in five-ton, double-walled, stainless steel, rectangular, recycled, open-top, former milk shipping tanks acquired from the original Williams Selyem winery (see photo below). These containers maximize surface area relative to height and weight. 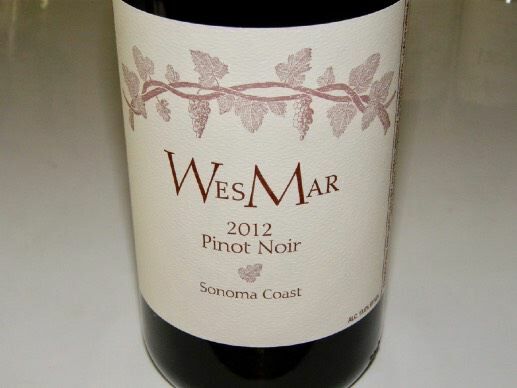 WesMar Pinot Noir is vinified as follows. Grapes are largely de-stemmed and the skins lightly pressed. A cleaned-up version of an indigenous strain of yeast from Jackass Hill Vineyard is used, available to winemakers under the Williams Selyem strain name. Caps are punched down by hand. The wines are sent to Francois Frerès barrels by gravity flow after long, cool fermentations. The wines are usually bottled unfined and unfiltered. The wines are sold through a mailing list and the winery’s website store at www.wesmarwinery.com. Kirk and Denise welcome visitors for tasting by appointment. Besides these reviewed wines, there is also a 2016 Sonoma County Pinot Noir ($39) and a recently released 2016 Salzgeber Vineyard Pinot Noir ($48). Magnums of all releases are available. This vineyard consists of 14.66 acres divided into three blocks and is located adjacent Hirsch Vineyard in the Fort Ross-Seaview AVA on Bohan Dillon Road in Cazadero. It is only five miles inland from the Pacific Ocean at an elevation of 1053 feet. Pommard and Dijon clone 777 are interplanted. The vineyard is a family business owned and farmed by Gard and Lori Hellenthal, and Lori’s sister Elisa. Gard and Lori’s son, Seth, recently died in a tragic truck crash in Cazadero. Besides WesMar, wineries that have sourced grapes from Hellenthal Vineyard include MacRostie, W.H. Smith, Radio-Coteau and Banshee Wines. The Fort Ross-Seaview AVA is defined by its elevation and proximity to the Pacific Ocean. The AVA statutes limit plantings to land 920-1800 feet above sea level or higher. Out of 27,500 available acres (43 square miles), only 555 acres are actually usable. The region arises above the fog line leading to a unique maritime ecosystem that is dry, sunny and warm enough for growing Pinot Noir and Chardonnay. Vineyards within this mountainous terrain are located on seemingly inaccessible hilltops, ridges and gullies. Despite the proximity to the Pacific Ocean, there are few sources of water. Fortunately, winters bring heavy rainfall, allowing many vineyards to reduce or eliminate irrigation between spring and fall when rainfall is minimal. 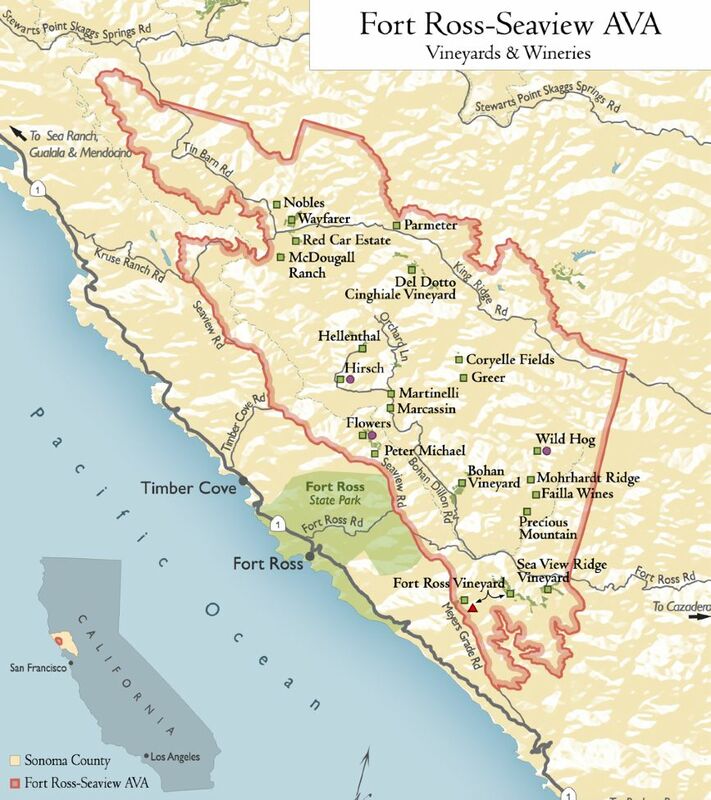 A map of the Fort Ross-Seaview AVA including the location of vineyards and wineries is below. I had a number of older vintages of WesMar Pinot Noir in my wine locker so I invited some friends over for a WesMar party. Most of them have little opportunity to taste aged domestic Pinot Noir so they found it enlightening. Wines tasted: 2004 WesMar Russian River Valley (Magnum), 2007 WesMar Russian River Valley, 2009 WesMar Russian River Valley, 2010 WesMar Russian River Valley, 2012 WesMar Russian River Valley, 2006 Oehlman Vineyard Russian River Valley (Magnum), 2012 WesMar Oehlman Vineyard, 2007 Salzgeber Vineyard Russian River Valley (Magnum), 2012 WesMar Salzgeber Vineyard Russian River Valley, 2004 WesMar Olivet Lane Vineyard Russian River Valley (Magnum), and 2012 WesMar Sonoma Coast. Impressions: (1) Magnums really do make a difference in age ability. All wines from the magnums were fresher. Even the 2004 Russian River Valley and Olivet Lane magnums had good color with no bricking and a significant amount of fruit. (2) The Russian River Valley bottlings, 2007-2012, in 750 ml, were all drinkable but were showing their age and should be consumed now. This bottling is for early drinking while the vineyard designates can be cellared for several years. (3) The peak drinking window for the vineyard-designates bottled in 750 ml would seem to be 6-10 years. The wines in magnum are capable of aging well into 20 years. (4) Surprisingly, my favorite wine by far was the 2012 Sonoma Coast which is a blend of grapes from Hellenthal and Balletto vineyards. At six years of age, this wine was really singing. I wish I had bought more past vintages of Hellenthal Vineyard Pinot Noir. My second favorite was the 2006 Oehlman Vineyard in magnum format.